Super Savings Item! Free Shipping Included! Save 38% on the Kirlor Fitness Tracker, V10 New Version Colorful Screen Smart Bracelet with Heart Rate Blood Pressure Monitor,Smart Watch Pedometer Activity Tracker Bluetooth for Android & IOS(Black) by Kirlor at Kode Fu Guru. Hurry! Limited time offer. Offer valid only while supplies last. What are the characteristics of the new version V10?A.Colorful Screen and 0.96'' touch OLED ScreenB.A variety of clock UI interface for your choice. What are the characteristics of the new version V10? B.A variety of clock UI interface for your choice. C.24 hours Continuously Automatic Heart Rate Monitor and Blood Pressure Monitor. D.Lithium battery capacity Increases, the work time lasts longer up to 7 days. What Can You Do with the Kirlor Fitness tracker? Compatibility: Bluetooth 4.0; Android 4.4 & above; IOS 8.0 & above. Charging time: About 1.5 hours full charge. Note: For this fitness wristband have longer life, please do not soak it in water for a long time. 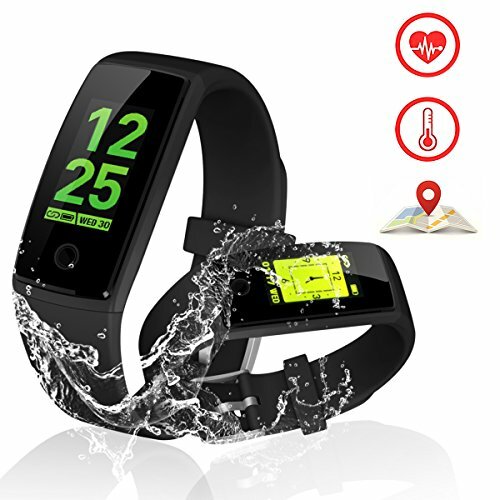 【Multi-function Activity Bracelet】Colorful Screen,24 hours Continuously Heart Rate Monitor and Blood Pressure Monitor,Pedometer, Timer , Mileage, Calories Counter, Sleep Monitor,Physiological Cycle Reminders, Sedentary Reminder, Call SNS SMS Alert, Camera Remote Control, Alarm Clock, Countdown, Stopwatch, Find Phone, Time Display, Touch Key. 【Built-in USB charging】The host comes with a standard USB port, specially designed to charge through your PC or mobile driver. So the sport fitness tracker can be charged with a computer or power bank without the need for other charging components. High Quality Polymer Rechargeable Li Battery Guarantee Long Lasting Battery Life of about 10 Days Standby Time/Up to 7 Days Operating Time. 【Fashion Design & Replaceable Bands】Kirlor fitness watch with 0.96'' OLED Colorful display screen. Slim, comfortable and easy to wear. Replaceable strap made from durable and waterproof materials, easy to install and remove.You will barely feel like you have anything on your wrist at all. 【Wide Compatibillity】The app supports most smart phones with Bluetooth 4.0. Support system: iOS 8.0 or above (iPhone SE, iPhone 5/5S/5C, iPhone 6/6S plus, iPhone 7/7S plus, etc. ), Android 4.4 or above(Samsung Galaxy S8, S7/S7 Edge,etc ). 【Note】 Please read the instructions carefully before use. If you have any questions, please contact our customer service. We offer 1 year warranty. If you have any questions about this product by Kirlor, contact us by completing and submitting the form below. If you are looking for a specif part number, please include it with your message.